Mold is unsightly with an unpleasant odor and causes serious damage to your home. It is also hazardous to the health of humans and pets. For people with allergies, asthma or compromised immune systems, mold can cause life-threatening illnesses. It has to go! The best way to get rid of mold is to hire professionals who know exactly how to do it efficiently and safely. However, you can give it a go if it’s only on a small area or on easy-to-clean surfaces (glass, metal, tile, fiberglass, etc.) and if you don’t have health problems that will be exacerbated by getting “up close and personal” with mold. 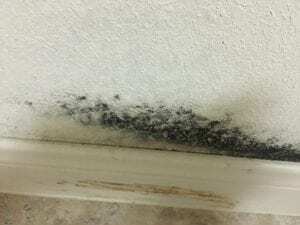 The Environmental Protection Agency insists that anyone dealing with mold wear body-covering clothing, rubber gloves, goggles and an n95 respirator. There are lots of mold removers on the shelves of your favorite big-box. Some work fine; some not so much; all are expensive. Look for a fungal biocide. Mist a moldy carpet or drywall to keep the spores at bay. Then use a utility knife to cut the carpet into manageable pieces, or use a drywall saw to cut out the drywall and any infested insulation. Quickly get the carpet or drywall and insulation into doubled heavy plastic bags and tie them off securely. So many small things that we use everyday are susceptible to mold: in the kitchen, anything that can hide moisture or food, such as cutting boards and plastic tablecloths; in the bathroom, shower curtains and bath mats; toys (for children or pets), particularly anything that squeaks or is plush; books; and clothing. Toss out the item, toss out the mold. It’s as simple as that—in the heavy-duty plastic bags, of course. If you have a persistent or widespread infestation, you likely will need to hire professionals. Unsure? Call in mold inspection and testing experts to determine the extent of the problem. They can then advise you if you can take care of it, or they will recommend a mold removal company.